Open Daily 10am – 5pm. All works are for sale. 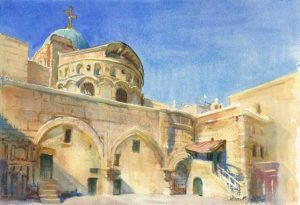 After the grandeur and precision of my series of paintings in Westminster Abbey exhibited there in 2018, I wanted to focus on subjects of equal magnificence but with a less formal approach, and a return to the Holy Land seemed a natural progression. It is a privilege to be showing some paintings from my journeys at Watts Contemporary. 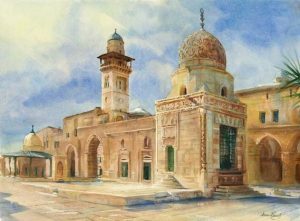 These journeys began in Jerusalem, exploring the hectic streets, the intricacies of gateways, fountains, the grandeur of mosques, churches & temples, from the Western Wall to the Holy Sepulchre and on to the Dome of the Rock. Jerusalem is several cities in one, each jostling for space, unified by faith and divided by dogma. While the city has a humble beauty, its stones resonate a spirit of exceptional complexity manifest over several millennia by the intensity of the beliefs and hopes of inhabitants and pilgrims alike. I worked on hasty sketches in the crowded streets & spaces, with broad splashes in watercolour and little time for details as I attempted to capture something of the power and peace of the place. 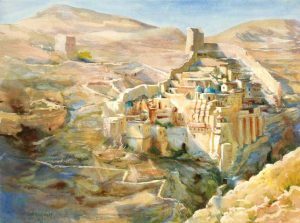 From Jerusalem to Petra was a journey back in time, through Bethlehem and the secluded cliffhanging monasteries in the high plateau of Judea into the Dead Sea valley, onward up to the Kings Highway to the rocky badlands above Petra. In Petra I found the very antithesis of Westminster Abbey. I embarked on a series of fresh, almost abstract sketches – colour, texture, dust and light, far from meticulous architectural detail. Harsh sunlight and mineral colours combine to make patterns of imagination. Against the uniformity of rock, the variations of texture and form are animated by changing light, shade and angle, providing a kaleidoscope of colours and surfaces which are a joy to the painter’s eye, often with the same static subject radically morphing from one moment to the next. 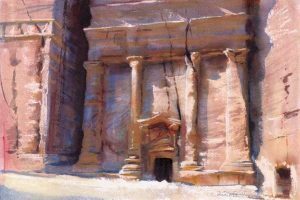 In Petra the voice of abandonment murmurs in the remnants of carved rocks. The eye is constantly caught by the hint of a carved figure, or the ghost of hewn steps which once had led to somewhere important. My inspiration grew out of a sense that the battle between the manmade and the natural had been reversed. Man had brought out the forms from the living rock, in the same way that Michelangelo had drawn his sculptures out of stone, liberating monumental figures from stone. Here too in Petra the fine carved facades seemed drawn out of the rock, and eroded for centuries, as if reverting to their original form, the works of man crumbling beneath the forces of nature. Was order emerging from the chaos of nature’s forms, or was it being eroded and ingested by time? The question was captivating. I have been bewitched by this dichotomy throughout my work, from derelict stately homes, burnt-out castles, classical ruins and war-ravaged cities. It all signifies that nothing is permanent, except perhaps the records of it all in art, literature and music.